Late last year, TV critic Alan Sepinwall wrote about the phenomenon of feeling the pressure to catch up on “shows that eventually get good.” We all know those shows; we’ve praised them to friends, or heard about them through family. They’re the shows we’d given up on after watching two or three episodes, only to hear from a trusted colleague that it got really good by the end of the first season. FX’s Snowfall is definitely one of those shows. Debuting last year, it took quite awhile for the show to find its footing, and while in the end it didn’t put it all together, it had found some necessary momentum in a few key storylines. 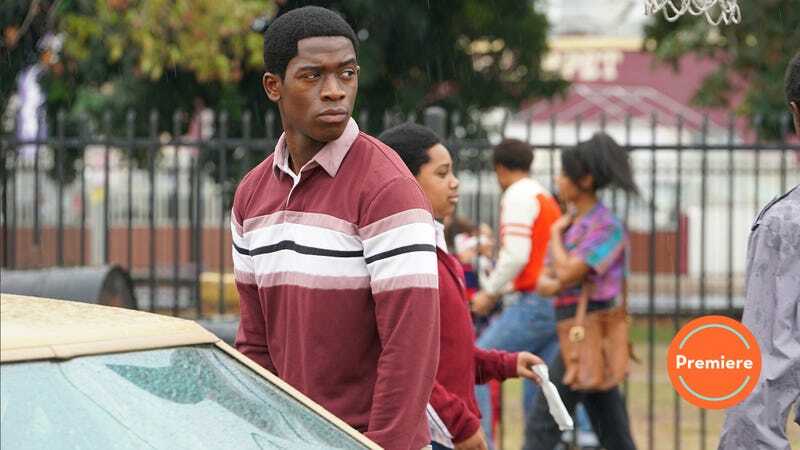 Namely, Snowfall succeeded in its first season when it focused on Franklin, and not its myriad of other characters, all of whom range from potentially fascinating to downright dull. The hope was that between seasons the writers would be better able to evaluate what worked and what didn’t throughout the first 13 episodes, and shift the focus as necessary for season two. “Sightlines” doesn’t exactly instill confidence that the show has learned some valuable lessons from a scattershot first season though, instead doubling down on the idea that Snowfall can deftly handle a number of different storylines at once. Red flags appear immediately, as “Sightlines” goes with the most obvious trick in the playbook to catch us up on the lives of Franklin, Lucia, Gustavo, and Teddy: a montage. It’s four months after the events of last season’s finale, and while Reagan and his government are unrolling the war on drugs through military actions in Latin America—“this war, we can win,” says a naive Teddy to his brother Matt (Jonathan Tucker), a Vietnam vet—business is good for Franklin and his crew. Crack cocaine is taking off in their community, and that means Franklin has more money than he knows what to do with. As in the first season, when Snowfall is focusing on Franklin it’s often at its best. Anchored by a shifting, nuanced performance from Damson Idris, Franklin’s story is one of subtle shifts and secrets kept. We don’t necessarily get a lot of insight into his mindset, but that’s largely the point. We’ve come to understand him as a smart, confident kid who’s always planning two steps ahead. That means he has to be a little cold and calculated. He’s more Michael Corleone than Tony Montana, and the suggestion is that’s how he’s managed to keep this business growing for four months. “Sightlines” does a good job of showing off how the success has changed Franklin. When he walks into Claudia’s club late in the episode, his former fear is completely absent. Instead, he grabs a drink, says “come on, let me talk to you” as he brushes past the woman who use to scare the hell out of him. That small moment of assuredness, coupled with the fact that he’s trying to buy the club, shows that Franklin’s ego is growing. Maybe an inflated ego is warranted, but every drug kingpin in fiction ends up a victim of that ego at some point. Snowfall isn’t interested in throwing Franklin into gang and cartel wars just yet though, instead choosing to keep the stakes more personal. It’s a smart choice. The relationship between Franklin and his mother was one of the highlights of season one; the absence of that relationship in the premiere is a promising sign. There’s a lot of emotional material to work with here. Franklin seemingly has everything he could want, but what has he lost in the process? His mother is struggling to pay her bills, refusing to see him or take his money, and on top of that his long time crush/girl next door Mel is forbidden from being seen with him too. Exploring the price of success is one of the few threads in “Sightlines” that suggests season two can expand its story in a meaningful way. The trouble comes once the show tries to balance the needs of its other stories. Much like last season, there are interesting aspects to the story of Lucia and Gustavo trying to pivot their business while anticipating the rise of crack cocaine, or Teddy having to go off the books to work for the CIA against the cartels in Nicaragua, but there’s never really enough time to give those characters and the plot the attention they deserve. In particular, The CIA/Teddy subplot was a mess last season. “Sightlines” does a better job of simply getting down to business—there’s no personal drama with Teddy’s wife, and the convoluted conversations about foreign and domestic policy are kept to a minimum. Because Congress won’t approve Reagan’s call for more funds, Teddy has to operate secretly. It’s all table-setting for the eventual Iran-Contra affair, but it’s compelling for that very reason. Sure, the show still doesn’t do enough to balance the different plot threads, but it’s good to know that there’s a destination here, not just Teddy meandering through the season. Similarly, Lucia and Gustavo spend much of the premiere talking about crack cocaine. They discuss it between themselves, they discuss it with a potential partner…and then Pedro shows up after a four-month absence. Again, so much of what happens in the premiere feels like getting the pieces into place for the season, and that’s both good and bad. It means that “Sightlines” isn’t necessarily the most thrilling episode, but it also means there’s reason to believe the show’s patience could pay off. After all, “Sightlines” ends on an abrupt cliffhanger that interconnects the disparate plots in an intriguing way, and the third episode of the season is written by one of the greatest crime authors of all time, Walter Mosley, who joined the writing staff this year. “Sightlines,” then, is more promise than anything else. In other words, the pieces are there, and we just have to wait and see how they’ll be put together. Jerome busting in on Kevin for getting busy in his bed is one of the few examples of Snowfall proving it has a sense of humor. It’s a good look. It’s clear that Avi is used to having his place raided by cops. So calm, while Franklin and Leon book it. Seriously, if you’ve never read Walter Mosley, do yourself a favor and go get some of the Easy Rawlins novels. Mosley’s prose is unrivaled, in my mind.